The Monicas from Halle-Heide playing at the Market-place during a BBQ in Ruurlo in August '98. 'Monica' is the nickname for the squeezebox in the 'Achterhoek', a border district in the East of the Netherlands. In this region especially, older men enjoy playing 'kitchen music', on impressive multiple-row 'cupboards'. But anyhow: the diatonic here is still an authentic instrument for playing folk music. For the instrument on this pages doesn't exist a good English word. The most common word is squeezebox, but the word squeezebox means all instruments with metal reeds and bellows. Diatonic accordion is a more better name. Diatonic means only CDEFG and not C#,D#,F#,G# etc. But that is a confusing description, because most of the squeezboxes mentioned here have (some) half notes! Bisonic accordion/squeezebox hould in fact be the real name! Bisonoric means: under one button you have two sounds: one by pushing and one by pulling. A nice wooden 'standard-example': 23 melodybuttons, 8 basses. The 'bisonoric' squeezebox is a typical instrument for playing western folk-tunes. That's the reason why it is played often in countries or regions with a strong cultural consciousness, e.g., the Basque region in Spain, Bretagne in France with a rather Celticflavor, Flemish Belgium where a kind of Dutch is spoken, Ireland, and the Frisian region in the North of the Netherlands. But the 'trekzak' is also rather popular in other parts of the Dutch country: in cities and villages in Northern Holland, people like to keep the houses and historic centres 'typically Dutch', and the folk music and the dance tunes as well. Because of the typical 'push-pull' sound (you'll recognize this also when violin players play folk dance tunes) the 'diatonic' is an excellent company for dance groups. Also in the 'Achterhoek', a region at the German border, there is a tradition of 'squeezing'. Mostly elder men, often farmers, like playing the three- and more rowed species. As a tradition, it is a popular instrument for wedding- and other parties. Italy really is the countryfor the diatonic. 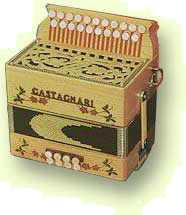 The well-known tarantella is often played with the instrument. The most famous builder of better quality boxes is found here: the firm Castagnari. The 4-5 row Steyrisch Harmonica (also known as Alp-accordion), the bisonoric bandoneon (known from Argentine tango, played by Astor Piazolla) and the bisonoric concertina are also members of this family. All of these instruments have in common that the buttons produce different notes when squeezing or pulling: they are bisonoric. It's because of that that they put out a kind of 'swing' that is stronger than the chromatic (e.g., piano-) accordions and makes the instrument very preferable to dance to. Hohner Pokerwork: without doubt the most common. 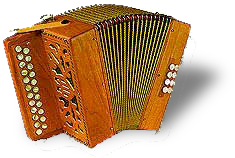 The most common type of the squeezeboxes in Holland is the Hohner 2-row C/F, called here 'Goudbrand' (Pokerwork). But at the moment the production of it has stopped. That's a pity, because the instrument produces a lot of sound (very good for playing street music). Also in the Netherland 'diatonics' are built, for example by Karel van der Leeuw, whose working place is in Utrecht. The 1-row box is quite well known in the pop scene, because it's the typical instrument for cajun music. Cajun is the county music, played by the French speaking inhabitants of the Mississippi delta. In the Netherlands there are various groups playing it. Also the French community of Quebec in Canada plays it as a traditional instrument (Ann and Kate McGarrigle). When you pull you get the 'opposite' chord from when you push (G/C or D/G or A/D, etc.). The hand-made Italian Castagnari is much more expensive, but has a kinder sound and a lot of various types. This is a Castagnari Roma. The 2-row box has the possibility to play in two chord groups (in Holland the standard is C/F, but there are lots of variations). Italian and Dutch folk, but also the Texas-Mexican music (TexMex) can be played very well on it. Also in Ireland it's very popular. Mostly the two rows differ by only a half (C#-D of B-C), so the whole tone scale can be played on it without changing the bellows direction, when playing over two rows. The 3-row box is very popular in the Eastern region district of the Netherlands (the Achterhoek) - especially among older people. But you should not be amazed when you hear and see a farmer or one of his employees playing a mazurka on it. The remarkable Steyrish harmonica is often played. This is a quite big squeezebox with at least four rows, very well equipped for playing what the Germans called 'Schlagers' or 'Heimatmusik': tearjerkers and so on. The Estonian Lootspill with his typical 'metallic' sound belongs to the same category. In other parts of the Netherlands (The Frisian region called 'Friesland' in the most Northern part of the West of the Netherlands) the harmonica (especially the 2-row) becomes more and more popular - also among younger people. It seems that every town has is own squeezeclub and (home-made) squeezebook!